Software defined storage allows you to move beyond a one-size-fits-all approach, but how do you know which size you need? This is where Lenovo and the Intel Storage Builders program comes in. We are proud to partner with two of the industry’s top SDS software providers – Nexenta and Cloudian - to deliver optimized solutions for unique application environments. We have collaborated with each of these partners to develop reference architectures that will simplify your deployment of SDS. Lenovo file, block and object storage solutions for SDS allow you to make SDS a reality for your business, simply and with confidence. 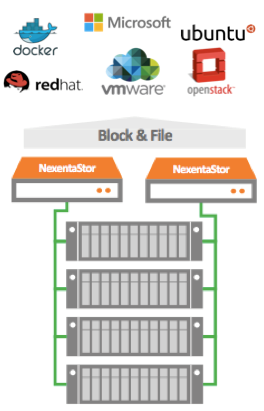 NexentaStor is Open Source-driven SDS, delivering unified file (NFS and SMB) and block (FC and iSCSI) storage services. Built on ZFS for Enterprise-grade data integrity and performance, NexentaStor features unlimited file system sizes, inline data reduction on the entire appliance, and scales from configurations in the tens of terabytes to petabytes. The Lenovo NexentaStor ServerSAN reference architecture begins with a base configuration of two Lenovo System x3650 M5 servers, featuring the Intel Xeon processor E5-2643 v3, and one Lenovo E1012 DAS device. With a minimum capacity of 48TB and 10Gb Ethernet, this Lenovo + Nexenta solution delivers Enterprise scale and performance storage capabilities at a fraction of the cost of legacy storage. For any enterprise, cloud service provider or cloud hosting provider seeking to build a public or private cloud object storage infrastructure, Cloudian HyperStore allows users to storage and access files from across multiple data centers and regions and any device, eliminating isolated islands of data. Cloud providers will benefit from the pay-as-you-grow approach to this highly scalable multi-tenant storage system and the ability to optimize management for multi-level SLAs. 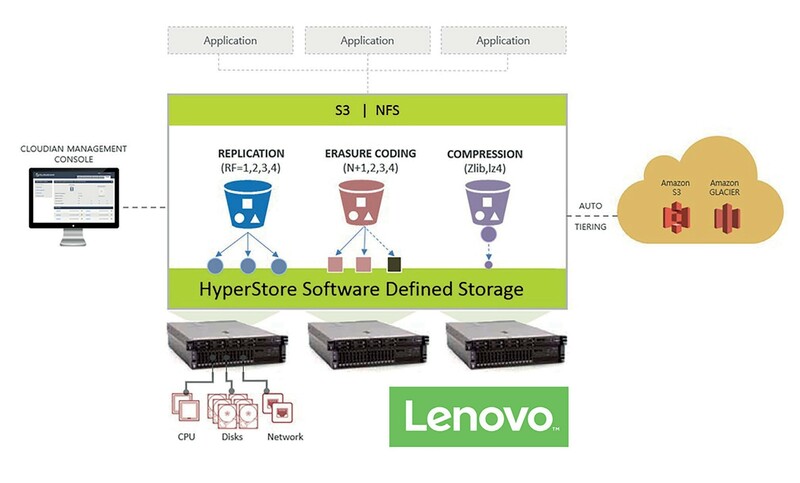 This HyperStore reference architecture provides massive scale-out capability based on Lenovo x3650 M5 with local storage. The combination of Lenovo servers with high availability components Cloudian Hyperstore software creates a fully distributed architecture with no single point of failure. In addition Cloudian HyperStore and Lenovo world-class hardware provide a unique 100% S3 compliant cloud-storage platform for seamless integration into your existing S3 apps. Deploying a new SDS infrastructure may seem daunting, but with Lenovo reference architectures you don’t have to do it on your own. We have worked with the best in the industry to allow you to confidently implement solutions that scale to your needs and integrate with your existing infrastructure. This is just the beginning - stay tuned for more ways that Lenovo will help you manage increasingly larger amounts of data while reducing cost and improving access.